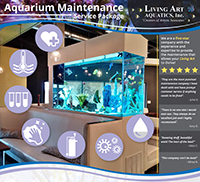 Aquarium Maintenance Services - Living Art Aquatics, Inc.
At Living Art Aquatics, our main goal is to provide you with the highest quality of care for your aquarium and underwater inhabitants. Through professional aquarium maintenance services, we keep your aquariums looking their best. We offer 24 hour care and emergency services to our clients. All of our technicians are hobbyists and have a deep understanding and love for the industry. They have been specifically selected for their positions and have undergone extensive training so you can be sure that under our care, your system will thrive and grow.